Steve Jobs believes in the Wayne Gretzky dictum about skating to where the puck will be, not where it's been. Verizon would have made a great launch partner for the iPhone, but it passed, and Verizon has been left behind. Every quarter the iPhone adds to the AT&T customer base, and every quarter someone talks up the end of the AT&T exclusive in the US. Undoubtedly this benefits Verizon, as it reduces defections to AT&T. Why move if the iPhone is coming anyway? The latest so-called cost benefit analysis by Christopher Larsen of Piper Jaffray suggests that Apple could gain 4.6 million sales by allowing Verizon and Sprint to sell iPhones, and it would only cost $50 of AT&T subsidy and around $25 in extra development costs per cellphone. After all, the iPhone market share in France rose from 15% to 40% in the 6 months after the end of exclusivity, so it should happen in the US too. This ignores the fact that all the networks in France are GSM. As soon as the courts ruled against the long term agreement with Orange, all Apple had to do was sort out contracts with SFR and Bouygues, and then let them get on with the marketing war. If the AT&T exclusive ended tomorrow, the only beneficiary would be T-Mobile, the only major carrier besides AT&T that uses GSM. Even if T-Mobile sells 1 million extra iPhones a year, that is as many iPhones as G1s sold. Based on the above figures, Apple would lose out. The average carrier price for an iPhone last quarter was slightly over $600 (Apple analyst conference call). With a 60% margin, the extra gross profit through T-Mobile would be $360 million, but, according to the Piper Jaffray figures, Apple would lose $50 per handset from AT&T. In just the last quarter AT&T activated 3.2 million iPhones, which would have cost Apple $160 million of the "extra" profit. 3G coverage? 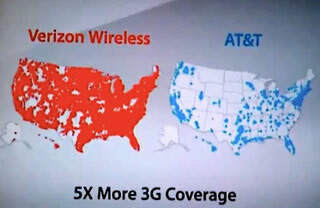 Verizon has a map for that! So the whole reason for ending the AT&T exclusive has to be moving on to the Verizon and Sprint CDMA networks, and these are networks that both carriers are busy transitioning away from because they recognise that they are not competitive for the future. Verizon, to its credit, seems to recognize that it is now second choice for smartphone manufacturers. It will start rolling out its LTE network in major markets next year and has accelerated this program so it can offer much more and faster data downloads. However, it will be at least a couple of years before enough is in place to offer a home for future iPhones - and even then voice will still use the CDMA network, which will complicate background processing of apps until VoIP becomes the standard for calls. Sprint is going the WiMAX route through ClearWire while trying to hold on to as much of its customer base as possible and come back from its streak of quarterly losses. Apart from the network issues, for the iPhone to be really successful on Verizon and Sprint and sell the 4.6 million Piper Jaffray suggests, Apple will need to duplicate the customer experience of the current and future GSM models. So the CDMA iPhone will need to be a world phone - but packed into the same iPhone shell so that all the third party cases and add-ons fit. This means that Apple Engineering would need to find a way of adding CDMA electronics to the current GSM electronics in the already packed iPhone while not affecting the battery life or the placement of any of the controls, USB, etc. When all the extra support costs are added in, making and selling a CDMA/GSM model for at most a few years doesn't seem that attractive compared to other opportunities, such as a model for China Mobile's 400 million+ subscribers. The end of the AT&T exclusive isn't going to happen in the States unless Congress mandates limited agreements to the benefit of T-Mobile, or if Apple sees a real advantage in moving on because AT&T tries to reduce the subsidies. In effect, the US and iPhone suffer from the CDMA/GSM divide, which the FCC will try to avoid in the next generation of mobile technology. Meanwhile, in other countries (like Germany and Spain) Apple will be eager to move onto other GSM networks and reproduce the French gains as soon as the exclusive agreements end. Nevertheless, there is one huge opportunity for a Verizon-Apple agreement: A future iTablet or ARM based netbook with G3 support would be a great way for Verizon to sell the benefits of its LTE network. This agreement would give Apple a good launch partner for a product that it would want to sell through the European operators to displace Windows netbooks and end Microsoft's mobile dream.